If so, then you likely have heard about mint sets and proof sets, but probably have no idea what they are or what the differences are between them. When I first began collecting coins, telling the differences between what mint sets and proof sets was really important to me. Because, as you will see here, mint sets and proof sets are very different types of things! Proof sets are sets of coins that have been specially struck with polished surfaces and, in recent decades, frosted images. Proof coins with frosty images are called cameo proof coins. Cameo proofs, while highly common since the late 1970s, are rather uncommon among proof coins from earlier years. Overall, the majority of proof coins struck since 1936 have brilliant, mirror-like surfaces and minute details struck in great clarity. The United States Mint has been making proof coins and proof sets since the 19th century. However, in 1936, the U.S. Mint began producing proof sets on a regular basis and in greater numbers than the proofs of earlier of years. Proof sets made since 1936 normally contain one example of every regular-strike coin being produced in a given year. Proof sets made before 1965 contain coins struck at the Philadelphia mint. Proof sets made since 1968 contain San Francisco mint coins. There have been a couple gaps in proof set production since 1936: 1943-1949 and 1965-1967. 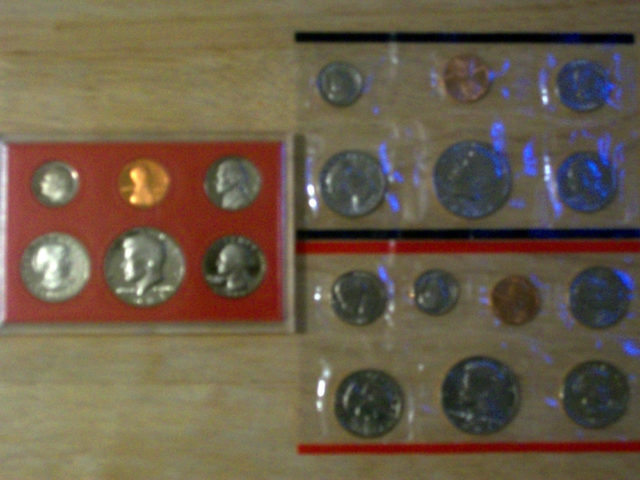 Proof sets made from 1936 to 1955 were contained in clear, small, soft plastic pouches, each holding one coin. These were then shipped to collectors in cardboard boxes. During 1955, the U.S. Mint switched from using individual plastic pouches (each holding one coin) to a flat package which houses all the proof coins in one sealed piece of cellophane with six pouches, each holding one proof coin. NOTE: Many of the 1936-1955 proof sets have been removed from their original packaging and have since been rehoused in hard plastic cases. This variation of cellophane proof set packaging used right up through 1964. 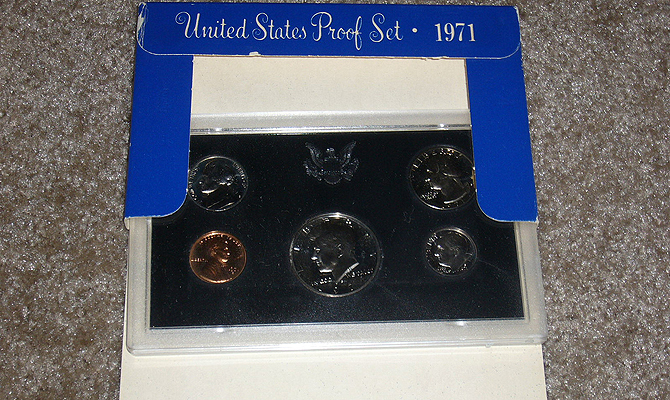 When regular proof set production resumed in 1968, the U.S. Mint began housing proof coins in a hard, flat plastic case. Though the design of the U.S. Mint’s hard plastic proof set cases has changed slightly over the years, the overall format has remained the same since 1968. Unlike proof sets, most mint sets do not contain coins that have been struck using special methods of manufacture. Instead, mint sets typically contain coins of usual, mint-state quality. 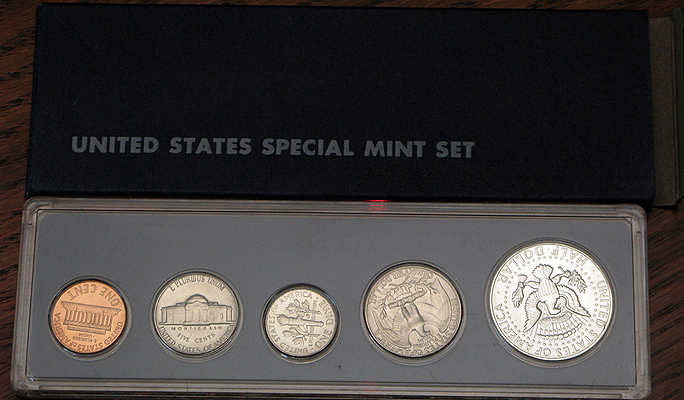 Mint sets contain coins that are uncirculated and look like (and are) straight from the Mint. However, they are not really any shinier or well-struck than usual, newly minted coins. The advantage to buying mint sets over simply removing coins from circulation is that mint set coins have never entered circulation, and therefore are pristine and virtually untouched. Mint sets also sometimes contain coins that you would otherwise not encounter in circulation. In fact, coins like the 1970-D Kennedy half dollar, 1973 Eisenhower dollars, 1987 Kennedy half dollars, and 1996-W (West Point, New York) Roosevelt dime are coins that were not released by the U.S. Mint into circulation but they are included in mint sets! Mint sets were first produced in 1947. 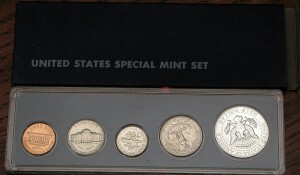 Back then, mint sets contained 2 examples of each design and each mint’s coins. These sets were assembled using cardboard panels that held the coins. Unfortunately, the cardboard holders (which contain sulfur and glue, and do not protect the coins from the air) left many of the coins inside them to become very toned and spotty over the years. It is important to note, though, that some of this toning is considered beautiful and desirable to certain collectors. In 1958, the United States Mint began assembling mint sets using sealed cellophane containers that include only one coin of each design and mint. This format had remained mainly unchanged until recently. In 2007, the U.S. Mint began housing mint sets in folders; a blue folder houses Philadelphia coins and a red one contains coins made at the Denver mint. Red and blue color coding for the two mints has remained the same since the introduction of cellophane mint set packaging in 1959. The soft plastic holders each contain two colored strips. Blue strips indicate Philadelphia coins, and red strips were used on packaging containing Denver coins (and San Francisco coins, during some years). Prices for proof sets and mint sets vary widely by date and variety. The least expensive proof and mint sets can be bought for less than $5 to $7 apiece for certain sets from the 1960s, 1970s, 1980s, and 1990s. Early proof and mint sets can cost the collector hundreds and even thousands of dollars apiece. We have a number of articles here at The Fun Times Guide to Coins which discuss the value of various mint sets and proof sets. In addition to those, you may also find prices for proof sets and mint sets in the Professional Coin Grading Service price guide. Likewise, A Guide Book of United States Coins contains annually updated pricing information on thousands of U.S. coins, including mint sets and proof sets. Don’t forget, proof sets and mint sets make perfect coin gift ideas for anybody on your birthday and holiday shopping list.